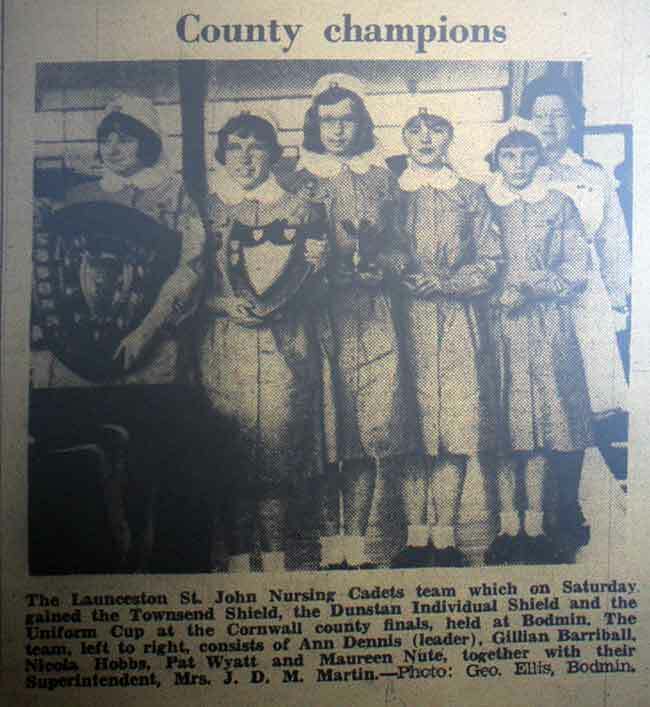 Launceston St.John Ambulance Brigade. | Launceston Then! 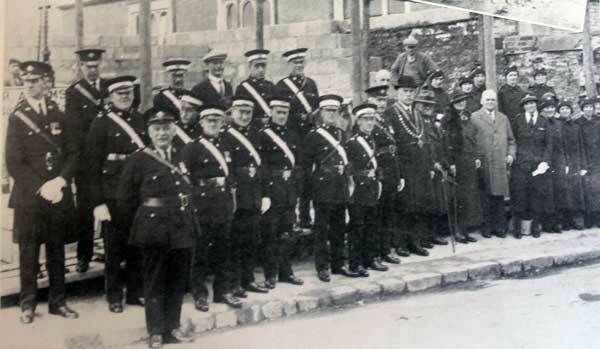 Launceston St. Johns Ambulance Brigade hall foundation stone laying ceremony in 1935. 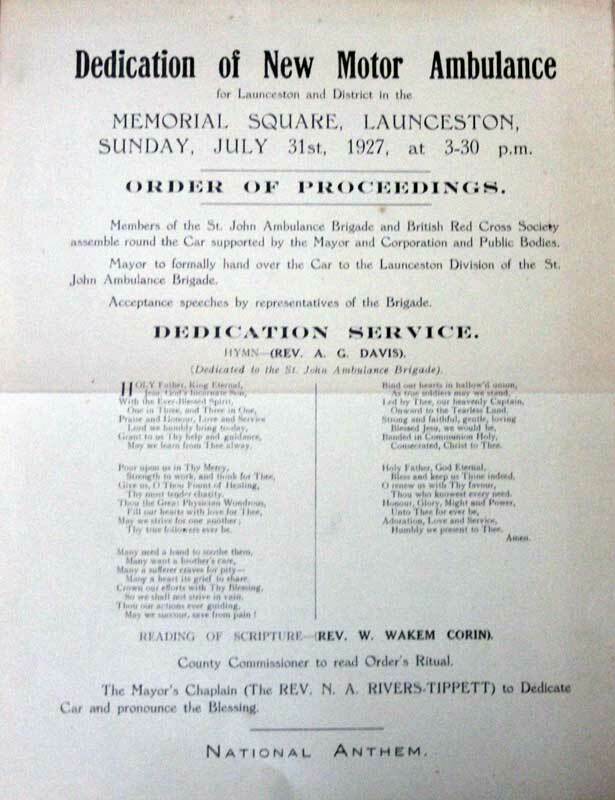 It was Dr. Shepherd, a very enthusiastic First Aider, who conducted a series of lectures in 1896 at which many including William Mills passed their first aid exams, and it is from this early date that the origins of the Launceston division of St. Johns Ambulance Brigade can be traced. He obviously had had the formation of a St. John Division in mind, for at the beginning of the First World War when the volunteers for the V.A.D. hospital night orderly duty were being sought, he insisted on all of them possessing certificates. Accordingly, the men all took the exam, and so many of them passed that there were enough to form a St. John Division, and early in 1915 Dr. Shepherd saw the culmination of his efforts — the formation of the Launceston St. John Ambulance Brigade. It was William Mills who signed the first form of application to form this Division and he carried out various other ‘writing duties’ as termed them, so that on formation of the Division it was natural that he should automatically find himself in the post of secretary. In fact, under the eagle eye of Dr. Shepherd he was, as he would recount later, ‘secretary, superintendent, office boy and everything else’ in those early days. The Division soon became well established, however, and William found that the secretarial work was more than enough for one man to do. Consequently, later that first year, the late Mr. Richard Heard was appointed superintendent and William became the official secretary. Below is the first entry in the minute book entered by William on the 10th of March, 1915. Messrs R. Heard, W. Allen, B. D. Lewis, W. Weighell, L. W. Goodman, B. C. Murton, F. W. Bewes, W. H. Philp, W. Ayres, B. J. Vanstone, W. T. Mills, R. C. Pearse, H. Roberts, W. H. Bluett, and E. Jim Stoneman. Mr. W. H. Philp proposed that we form a Division of the St John Ambulance Brigade. This was seconded by Mr. W. Allen and carried unanimously. Mr. L. W. Goodman proposed that Mr. W. T. Mills be the Divisional Honorary Secretary. This was seconded by Mr. B. J. Vanstone and carried unanimously. 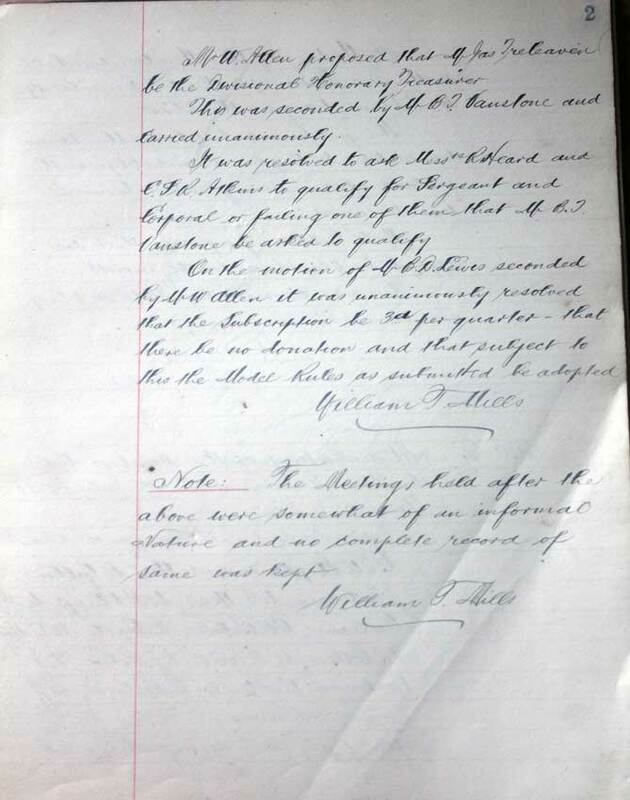 Mr. W. H. Philp proposed that Mr. Willie Allen be the Inspector of Store. This was seconded by Mr. R. C. Pearse and carried unanimously. Mr. W. Allen proposed that Dr. T. W. Shepherd be the Divisional Honorary Surgeon. This was seconded by Mr. W. Weighell and carried unanimously. Mr. Allen proposed that Mr. James Treleaven be the Divisional Honorary Treasurer. This was seconded by Mr. B. J. Vanstone and carried unanimously. These were the only minutes recorded over the following 8 years as the meetings were held in an informal matter. Although that first meeting took place in the Drill hall, subsequent meetings were held at the Fire Station next to the Town Hall (now the Green Room for L.A.D.S) . William held a host of memories of his St. John work down through the years — a veritable verbal history of the movement locally — from the first days when, he said, the main duty seemed to be the keeping of almost recovered Australian soldiers in their hospital beds — or of smuggling them back into the hospital late at night! He and Richard Heard worked side by side for many years from those beginnings, and twenty years later they both had the privilege of journeying to London together and being invested as Serving Brothers of the Order of St. John, a well-merited recognition of their services for the movement. William Mills was active in his Brigade work to the end and who held the rank of Ambulance Officer, would recall that after the Town Hall hospital closed down, the Division carried on maintaining their first-aid efficiency, practising assiduously and carrying out any public duties to which they were called. As previously mentioned they met weekly at the Fire Station, and worked in close conjunction with the Fire Brigade. 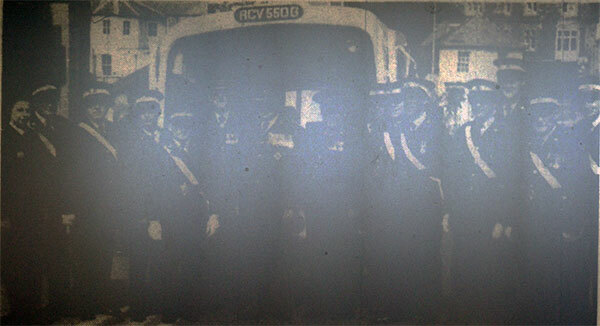 It was in 1921 that the Launceston Division first undertook the work which made their black and white uniforms so familiar over the whole of North Cornwall and West Devon – in that year they received their first ambulance, and William could well remember that old vehicle, a Ford model ‘T’, for he traveled many thousands of miles in it. He remembered too, the Austin Ambulance which replaced it in 1927 and which was paid for by local appeals a course that was followed when a third vehicle, again an Austin, was acquired. 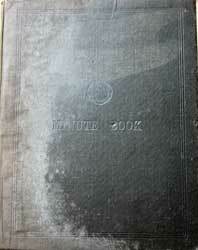 Coming back to the minute books, at the December 1923 meeting the division discussed transferring to the Plymouth district having been part of Cornwall for the first 8 years. The motion was unanimously carried in favour. It wasn’t until 1924 that the brigade were fitted out with full uniform provided by St. John’s with the cost’s being paid out of the divisions funds. It was at the May, 1926 meeting that the first talk of an ambulance garage was discussed, with the Brigade having been offered the opportunity to purchase the old International garage in Market Street by Mr. Percy Spry. It was agreed to form a committee to inspect the building with a view to renting or purchasing. The committee duly reported back at the November meeting stating that it was considered with some alterations that the building might be suitable for headquarters. The asking price was £950 less £5 towards conveyancing with a covenant that it should not be sold or let for a garage except the small garage. It was proposed by Mr. Williams that £900 be offered with a free conveyance, Mr. Mooney seconded this. Mr. Gibbens moved as an amendment that seeing as the cost of the place was so high the question of purchasing the same be dropped. The was seconded by William Mills and on being put to the meeting 5 voted for the amendment and 10 for the proposition which was declared carried. At the April. 1927 meeting it was decided to form a new squad to work with the ambulance with Corporal H. J. Dunn being placed in charge. 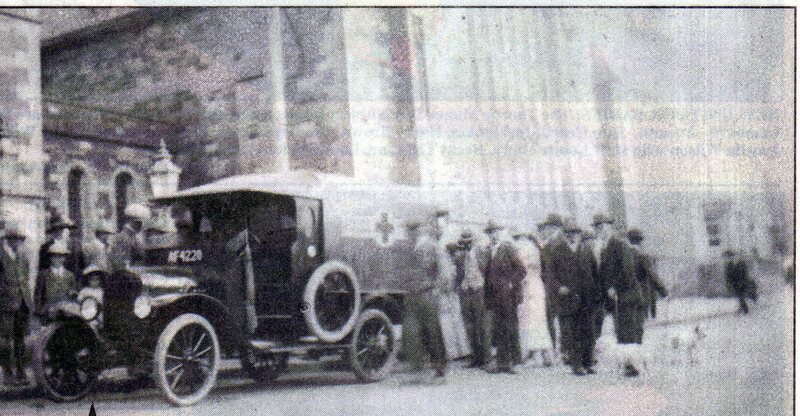 At this same meeting the new ambulance was discussed with members looking at photographs and specifications from Austin and Dodge. On being put to the meeting, 11 voted for the Dodge and 13 for the Austin. Superintendent Heard reported that he had received from the Baptist Church Trustees an offer to sell the division their church in Western Road. After consideration it was decided to inform the section committee that the property is on the market and was considered suitable for the divisions requirements, seeking approval to negotiate the purchase. At the following meeting held on September 6th, 1927, it was resolved to abandon the proposal to purchase the Baptist Church and that to seek the use of the Drill Hall in Westgate Street. However, this wasn’t the end of the matter for the vacant Baptist Chapel, for at the February 5th, 1929 meeting a delegation including Mr. A. White attended, explaining the terms upon which the Baptist Church Trustees would sell their old chapel. The purchase price was £600 to be paid in 2 years with the interest set at 6%. It was decided to inspect the property the following Thursday, February 7th and at the meeting held on February 20th, it was decided that the Baptist Chapel was not suitable and this avenue was finally dropped. In early November 1929 an accident occurred at the Launceston Gas works where several workmen were injured. Soon on the scene were Messrs. G. Mooney, R. Gibbens, and W.E. Farley who administered first aid within the Gasometer for which they were commended for. 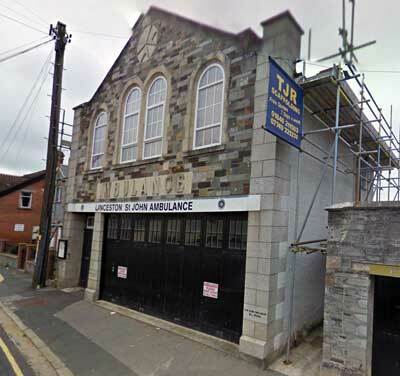 The minute book now has a gap of 7 years and no reason is given for this, but it was during these years that a site in Westgate Street, next to the Drill Hall was purchased and in 1935, practically debt free, the new Ambulance Station was opened. The first set of minutes available in the 1930’s, from the December th, 1936 meeting, show a discussion on a proposed transfer of the Launceston and District Motor Ambulance Service to Devon. But the members decided to remain with the Cornwall Voluntary Aid Organization and at the same time to return the Brigade to Cornwall. agreed to take charge of the Cadets and train them for the preliminary first aid examinations. The Rev. C. D. Day agreed to assist Mr. Farley. In 1941 Richard Heard, after 26 years service was made County Officer and Mr. W. G. Mooney (right) took over as Divisional Superintendent. (0769) The next minuted meeting was held on May 7th, 1945, and it was announced that the May Day dance had raised nearly £30 and on the motion of Cadet Superintendent J. Langman, it was agreed to donate the net proceeds to the local ‘Welcome Home Fund.’ It was also announced at this meeting that Richard Heard was leaving Launceston for Exeter and it was agreed to make a presentation in recognition of his services to the Brigade. This meeting also saw a change in Divisional Superintendent with Mr. Wilfred Ernest Farley taking over. It was nearly another year before the next meeting took place and here it was resolved to appoint a paid ambulance driver on wages of £4 10s. per week less insurance deductions. A ballot was held between Les Northey and David Lake with Les winning and being duly appointed to start work on April 29th, 1946. However, Les Northey resigned within a month of starting and David Lake was appointed in his wake, taking up his position on June 10th, 1946. Later that year, central heating was installed at the Station costing a total of £120. At the same time permission was granted for an electric kettle and electric boiler. At the February 18th, 1947 meeting the question of replacing the Austin 20 ambulance which was no longer fit for purpose, was discussed. 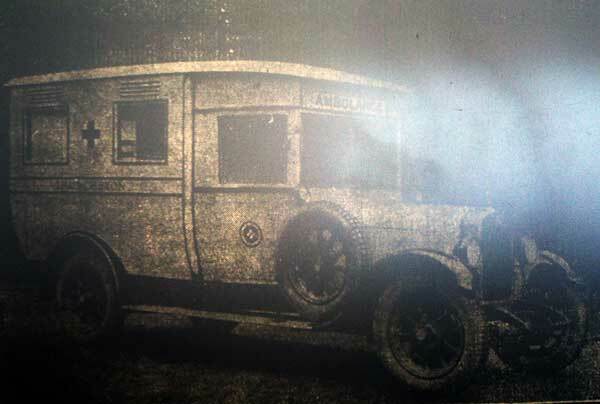 Mr. Mooney submitted particulars for an ex war department ambulance whilst Mr. John B. Smith (J.B. Smith and Son), gave the meeting particulars on a Bedford ambulance. In the end it was proposed by Dr. O’Connor, that war department ambulance, not a second hand one, be purchased providing that the cost did not exceed £1,050. 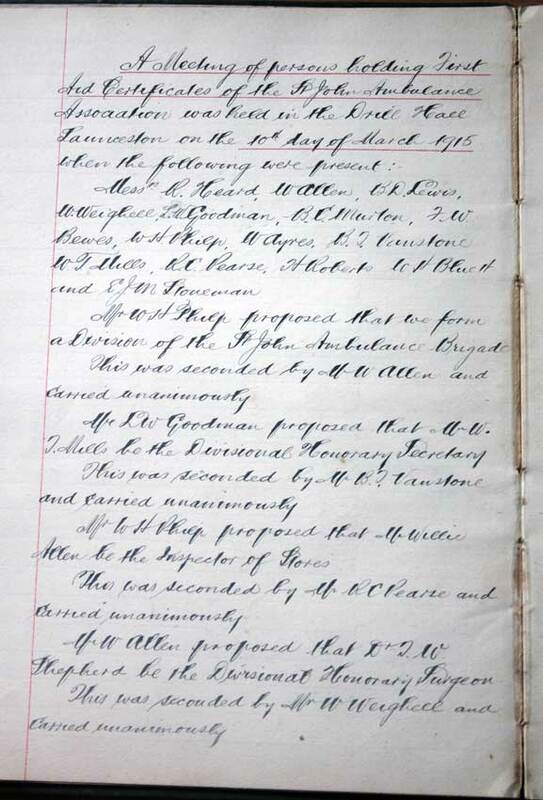 At an amended proposal by Mr. Lake, it was agreed that a new ambulance be purchased and that a six man committee be formed to deal with the purchase.This committee duly met on march 4th, where it was resolved to purchase a new Bedford ambulance from J.B. Smith and Son. The new ambulance was duly delivered in 1948, but by this time there were major changes to the country’s health care with the formation of the National Health Service and the impact that this would have on the Brigade was discussed at the January 19th meeting. 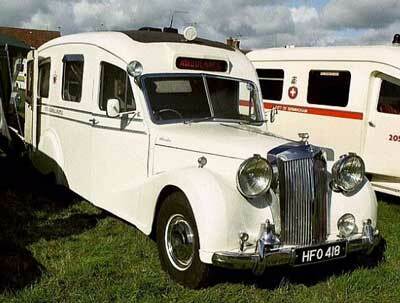 At the May 1948 meeting the matter of the other Austin 18 ambulance was discussed and whether it should be replaced. In the end it was decided to hold the matter in abeyance until January 1949 and then to have the vehicle checked by a motor engineer for its roadworthyness. An Austin 18 Ambulance similar to the one run by the division in the 1940’s. After and inspection by the R.A.C. Which stated that as the Austin was 13 years old, it would not be cost effective to make any extensive repairs to it. So at the January 1949 meeting there were two proposals to replace the Austin, one for an Austin Welfarer ambulance and another for a Bedford Ambulance. After a series of votes it was agreed to the purchase of the Austin for £850. It was also agreed that it should be painted lilac. Prouts garage were tasked with patching up the old Austin until the arrival of the new ambulance. 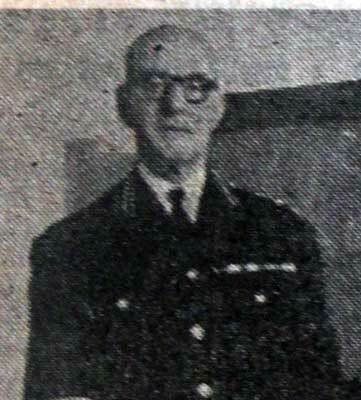 Mr. Farley resigned his position as Divisional Superintendent in May 1949 with Mr. Lake taking temporary charge until Mr. Samuel Matthews took over the role. It was in May of 1950 that the idea of extending the ambulance station was first discussed and a committee was formed to consider the options. On this committee were Dr. Rich, Messrs Matthews, Mills, Aimes, Oatey, V. Lake, Northey, Mooney and J. Lake. In October 1950 members inspected a demonstration Austin Sheer Line ambulance (a similar model below) and it was agreed to place an order for one which was delivered at the beginning of March 1951 with the new ambulances dedication by Canon Andrew in June 1951. To show how times have changed a meeting held in 1952 discussed the situation of a Private H. G Nelder. The minutes record ‘The question of Private H. G. Nelder’s association with a married woman, he being a married man was considered. It was resolved that Private Nelder be asked to resign his membership of the Division.’ At the next meeting held on November 10th, where a letter was read out from Private Nedler asking that his resignation might be postponed until the end of the year. It was decided that the resignation be accepted from this date. However he applied to re-join the Brigade the following year. The division was shook when founding member and secretary William Mills died suddenly in 1953 at the age of 76. Such was his involvement with the Brigade that the loss was greatly felt and at the March meeting a minutes silence was held. In October 1953, Mr. W. J. Mitchell was appointed Divisional Superintendent and Mr. H. Braund the new Hon. Secretary. The following January, Mr. Reuben Hicks was appointed the Divisional Superintendent. Also at this meeting it was agreed to concrete over the yard to the rear of the Ambulance Station with the members taking it upon themselves to complete the work. In October 1954, armchairs were purchased from Timothy White and Taylor, and a televison for those standing on call although this latter decision did not go down with some in the Nursing Division. It was at the February 6th, 1956 meeting that the subject of the extension to the rear of the Ambulance Station was again raised with Vic Lake showing the meeting the plans that had been drawn up. After lengthy discussion on how best to finance the scheme, it was agreed to obtain estimates. At the next meeting held in December, it was decided that given the costs, they would not be able to proceed at that time with the extension. However, by the February of the following year, the plans had been passed by local authority, and estimates were then sought from Messrs Worth, Fry, and Hobbs and Biddlecombe. Worth’s were the successful bidder and they commenced work early the next year. The extension was officially opened on June 7th 1958 with the cost being defrayed entirely from the Divisional funds. In 1960, Cornwall County Council asked permission to garage one of their ambulances in the station and this was granted at the rental of £1 per week. At the October meeting it was discussed the need for replacing the ambulance. It was agreed that £1,00 should be transferred to a deposit account and a public appeal should be launched to help raise the further funds required with the Mayor, Mrs. F. Hicks, as sponsor. Also at this meeting Mrs. Healey remarked of the serious shortage of District Nurses and outlined the measures which were being taken. In regard to the new ambulance a committee was set up to organise fund raising events. A special luncheon and tea was organised in the Town Hall, with Coffee being served in the Ambulance Hall. The Drill Hall was to offer stalls and sideshows, and in the evening a whist drive was held in the Ambulance Hall. 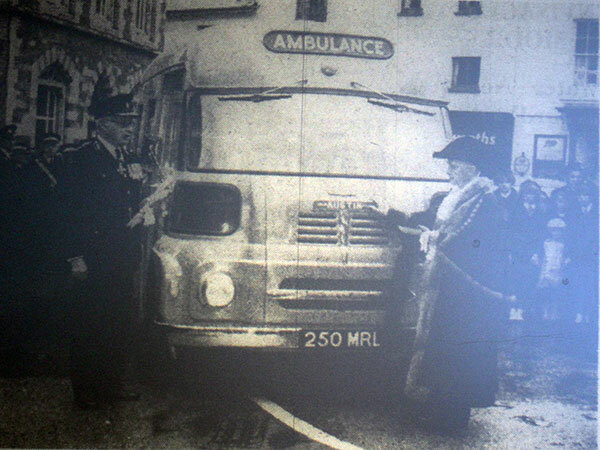 With the funds raised a new Austin ambulance was ordered through Prouts and duly arrived in August 1961 with the dedication held after a parade and service at St. Mary’s on October 22nd, 1961, with the Rev. Revell of Laneast conducting the dedication. The new ambulance had been fitted out of the two top deck stretchers at the expense of Mr. And Mrs. Prout in memory of Mr. Reginald Prout who had recently died. 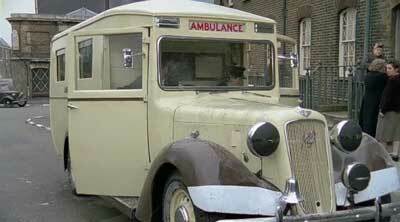 The old ambulance was subsequently sold for £105. The 1964 AGM minutes recorded that 10,837 miles had been travelled, with 235 patients being transported. Public duty hours stood at 261 hours, transport duty 1142½ hours, and special hospital duty 15 hours. The minutes also state that the new ambulance had been suffering with mechanical problems but that Prouts garage had bourne the costs. It was also at this meeting that a Jubilee dinner was announced for the following year. The subject of a replacement ambulance was brought up in the 1968 AGM, with figures on a new BMC LD ambulance that some members of the committee had seen at a recent commercial vehicle show. It was unanimously voted to purchase a new ambulance of the LD type to be supplied by Messrs Appleyards but purchased through Prouts which was duly delivered later on in 1968. The Brigade continued to hold its AGM’s which reported a continued success in its operations right through the 1970’s. In 1977 it was stated that a couple of hundred pounds would be need so that the ambulance could have a re-spray. At the 1980 meeting the long standing Treasurer Mr. Oatey resigned being replaced by Mr. D. B. Allen. Also at this meeting it was agreed that the central heating system should be converted to gas. In 1981 the long serving Victor Lake sadly passed away after serving as the Brigades Divisional Superintendent for 27 years. Launceston St. John Ambulance Brigade Gallery. 1927 Ambulance dedication service sheet. 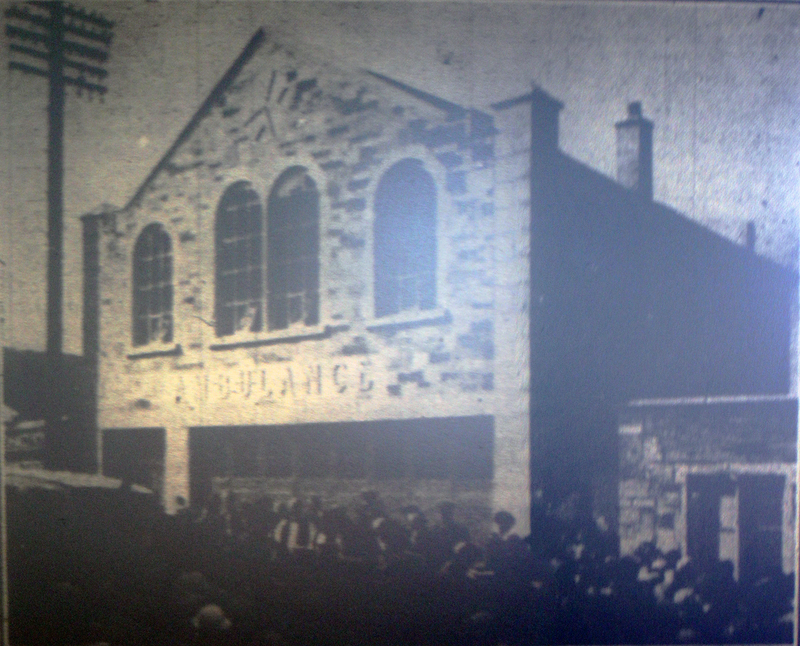 The official dedication and opening of Launceston's St. John Ambulance Station in 1935. 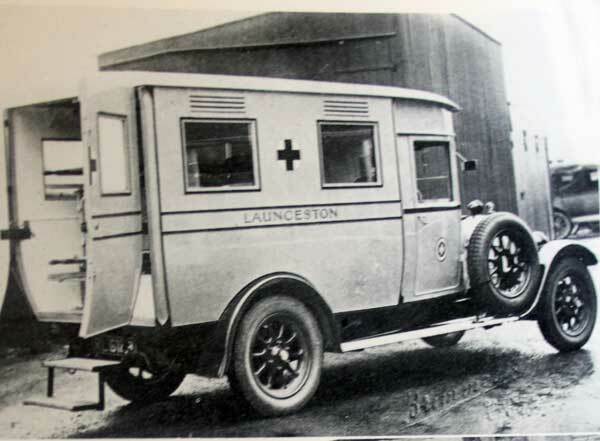 Launceston St. John Ambulance Brigade's new ambulance in 1933. 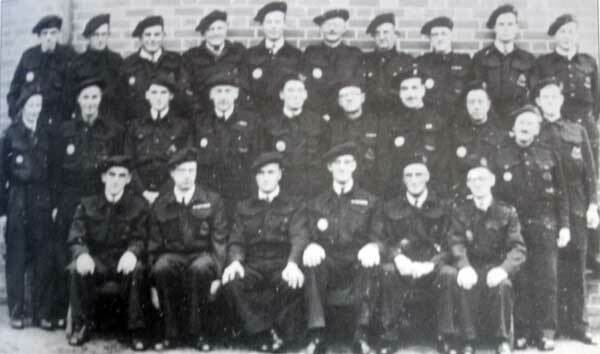 Launceston St. John Ambulance Brigade detachment during the Second World War. 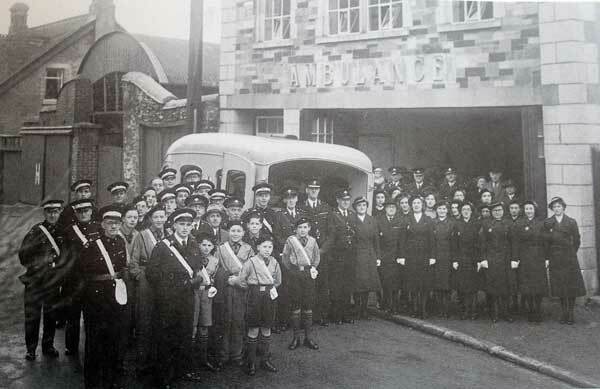 Launceston St. John Ambulance Brigade and their new ambulance in 1948. 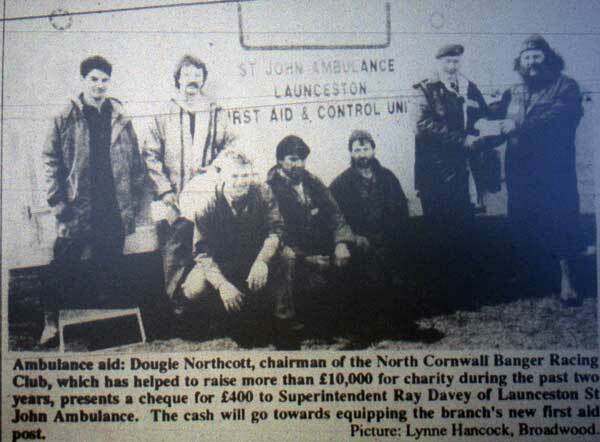 North Cornwall Bangers present Launceston St. John Ambulance Brigade with a cheque in 1993. 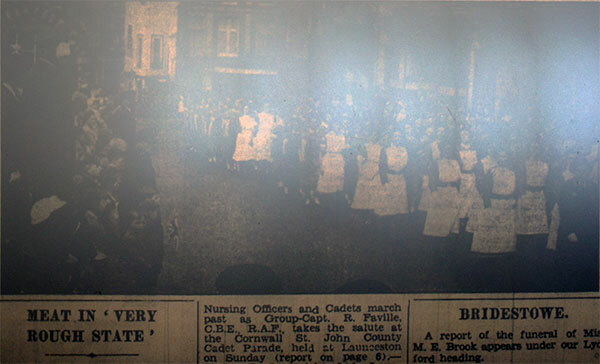 Cornwall St. John Cadets parade through Launceston Town Centre in 1954. Launceston St. John Ambulance Brigade with their new ambulance in 1968. Launceston St. John Ambulance Brigade is officially handed over by Mayor S. G. Adams in September 1961. 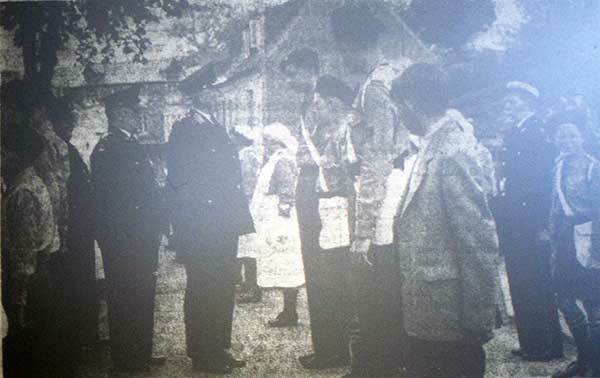 Launceston St. John Ambulance Brigade being inspected by Major General J. Kirkman in June 1958. 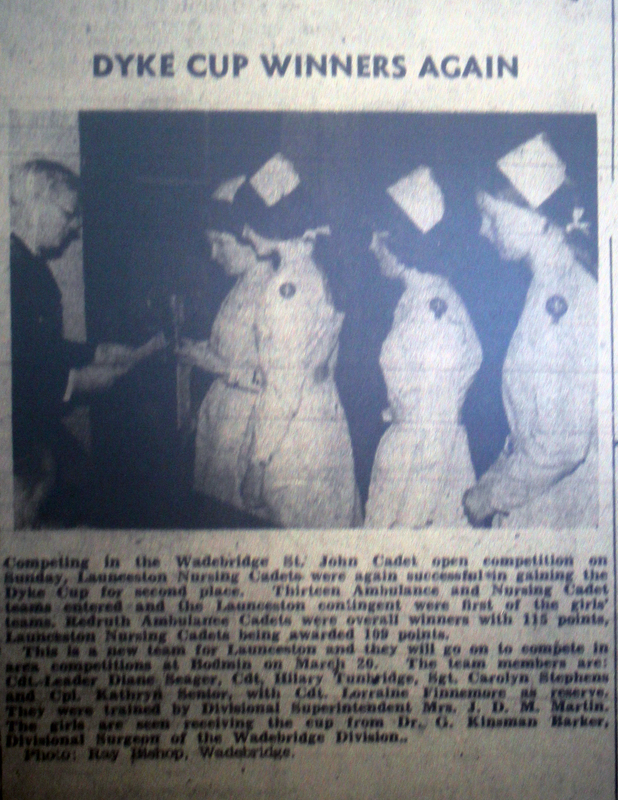 Launceston St. John Ambulance Brigade Nursing Cadets in 1965. Launceston Dyke Cup Winners from 1976. 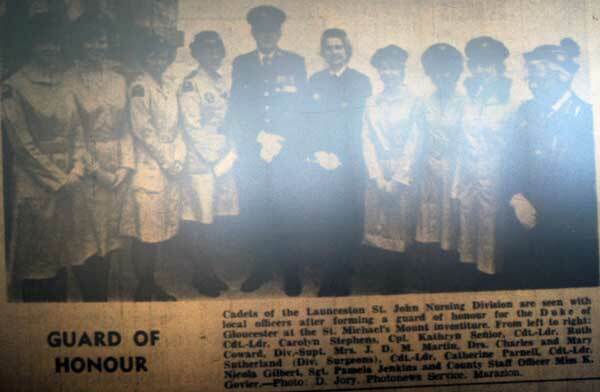 Launceston St. John Ambulance Nursing Cadets form a guard of honour in 1977. 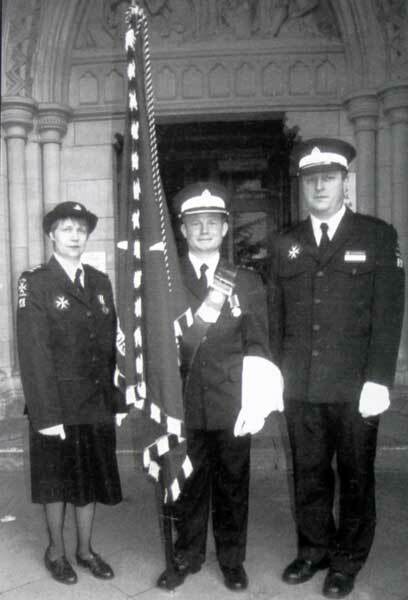 Launceston St. John Ambulance Brigade at the 2001 County Carol Service.